You’re in hospital and you need to have a blood test: What do you think would reduce your pain? You probably went with option 2. But in babies option 1 is often prescribed. It is difficult to test whether painkillers work for very young children and there is often uncertainty about the best dose to give. But if Professor Rebeccah Slater and her research team at Oxford are successful we may find alternative ways to measure pain in babies and may eventually be able to offer babies some better options to soothe their pain. The research, published in Current Biology, looks at how babies who have been born prematurely respond when a routine blood sample is taken from the heel of their foot. Premature babies routinely have to undergo as many as ten painful procedures a day. The researchers – with permission of the babies’ parents – monitored a selection of premature babies’ brain activity and reflexes during some of these routine procedures. In the study the babies’ brain activity was also measured by placing electrodes on their heads prior to the blood tests. This study suggests that top-down inhibitory mechanisms may begin to emerge during early infancy. As adults, we may instinctively stop ourselves from pulling our hand away from the handle of a hot pan if the alternative would be to tip boiling water everywhere, a potentially more dangerous result: that’s an example of top down inhibition. 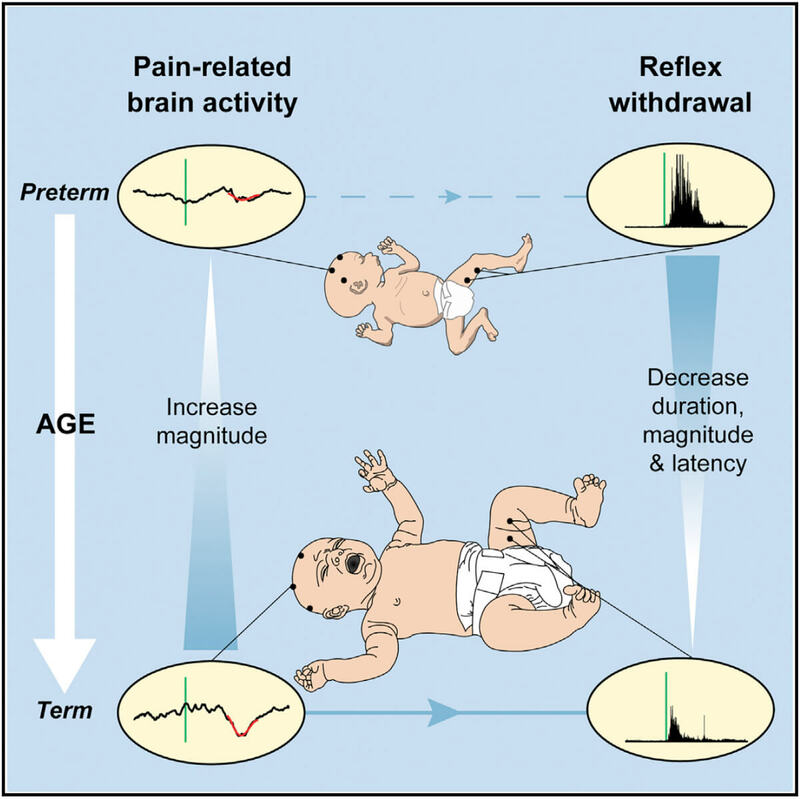 The observation that, as the babies get older, more mature brain activity is related to more refined reflex activity, suggests that these inhibitory mechanisms may begin to play a role.